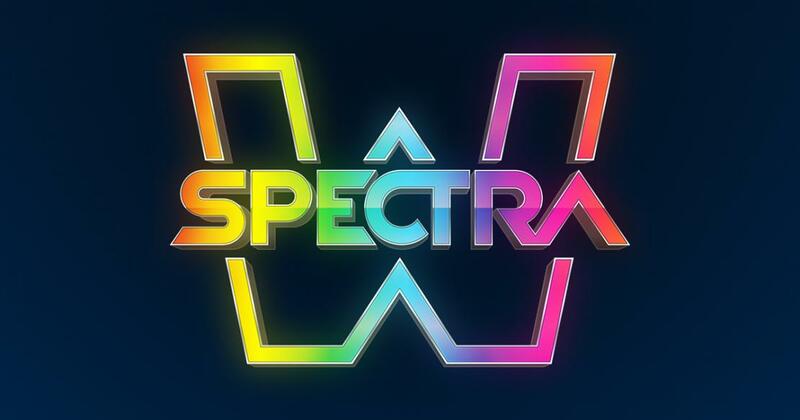 Spectra is a game with a neon style design, with very simple looking graphics, but which promises to pay big. Spectra is one of the Thunderkick slots, and one of their simpler looking games at the same time. You basically get just outlines of objects or simple geometric shapes, and they are made to look almost like neon signs. The W logo stands out somewhat, but for the rest of the symbols the images appear to show a Bar logo, a red 7, a golden bell, a shamrock, a pentagon, a diamond and a square. All these are shown just as outlines, with the borders colored in green, red, pink, gold and a few others. The W logo is the only one that’s sporting more than two colors. It’s not the most interesting of designs, but I will give it points for originality and for making the classic theme feel a bit different. Despite the classic inspired theme, 30 active lines are offered for the slot’s 5 reels. You have a decent Return to Player to work with, of 96.4%, while individual wins will reach $2,000. The slot mentions that wins of up to $240,000 are possible, though I don’t see exactly how you’d get there. As for the features, you get stacked wild symbols, wild nudges and respins. Every game from Thunderkick follows the same lines when it comes to wagers. You have to spend at least $0.10, and at most $100, for one spin. The total amount is the one used to determine the individual wins, not the line bet. The game’s features will revolve entirely around the stacks of wilds that show up everywhere. You get wilds to use them as substitutes, but they also pay quite well, up to $2,000 for a single combo. These are stacked and four symbols high, having the potential of covering an entire reel. Having a wild stack cover a reel will determine a respin feature, during which you get the Nudge Wild extra. What this means is that any new wild stacks that appear will be nudged into place, so that they cover the center of the reels they’re on. Spectra’s graphics are simple, minimalistic almost, but also modern. The features are not quite as simple as the classic theme might suggest, on the contrary, so there are certainly things to look forward to in this game.